The boss of a troubled steel company has died in a fall from his London apartment two weeks after the family business went bust. Angad Paul, the CEO of British steel maker Caparo Industries, died Sunday, after falling from the eighth floor of his central London home, the company said. Police have no reason to believe a crime was committed, a spokeswoman said. She would not comment further on the possible cause of death. MIT-educated Paul was the son of Indian-born steel magnate and philanthropist Lord Paul, who founded Caparo in 1968. Caparo filed for bankruptcy last month, putting 1,700 jobs at risk. It lost $8 million last year, due to a collapse in steel prices and the strong pound. Steel prices have plunged because of a sharp fall in demand in China, the world's biggest producer. Its companies are now being accused of dumping unwanted steel on other markets, forcing rivals to close their plants and put thousands of people out of work. Chinese steel exports rose by 27% in the year to August -- that's equivalent to 15 million tonnes. And that came on top of growth in exports of 50% last year. European officials are holding an emergency meeting in Brussels Monday to discuss how to address the crisis in the region's steel industry. The E.U. has already imposed some anti-dumping duties on steel imports from China, hoping to give protection to European producers. U.S. producers are pushing for similar tariffs to be imposed on China. 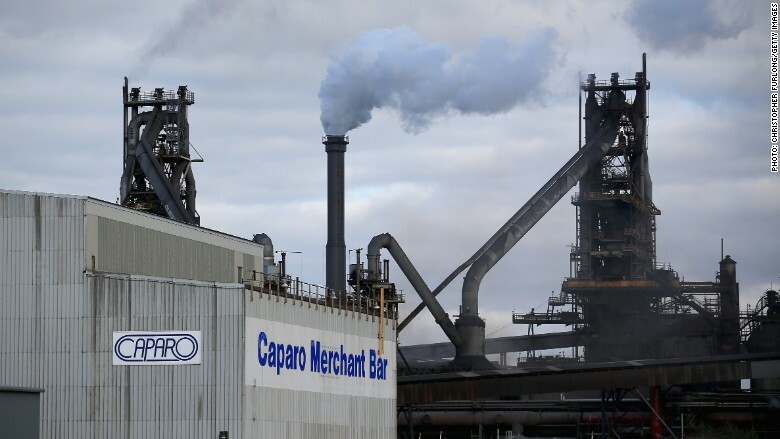 Caparo is just one of many steelmakers in trouble. India's Tata Steel announced last month it was cutting 1,170 jobs, while ArcelorMittal (AMSYF) reported third quarter losses of over $700 million on Friday, compared to profits of $22 million during the same period last year.